What does our dragonfly symbolise? If you don't know me either in person, or through thewonderful world of blogging, the Hugs logo may look a wee bit confusing. Let'sbe honest dragonflies are many things, but they are not known for beingparticularly cuddly and, if I'm perfectly honest, I wouldn't want one huggingme even if they were; beautiful as they are, those stick like bodies aren’tshouting hug me! Anyway, that aside I feel it’s time you knew why the dragonflyplays such an important role in my life, and it gives us an opportunity to getto know one another a little better. Some years ago, I received the worst kind of letter anyone could ever imagine. It was a suicide note from an ex-boyfriend. It was a time of absolute turmoil and not something I would ever wish on anyone. I won’t talk too much about that now as it’s something I’d like to address in the future, but through the trauma, I discovered Project; and eventually I plucked up the courage to have my own semi colon tattoo. 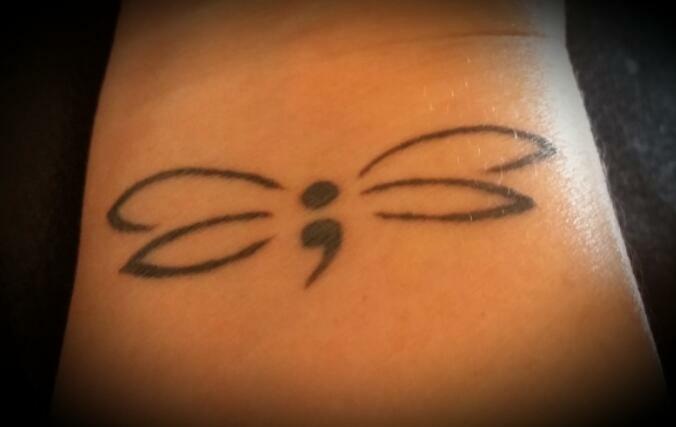 Being me, I didn’t just want a semi colon, I’d struggledwith my own mental health for some years and I wanted to add extra meaning and soI have a beautifully, simple dragonfly tattoo. I chose a dragonfly because when I researched them I foundthat they symbolise many things including strength and new beginnings. However,I also discovered that some species of dragonfly moult up to 15 times beforethey immerge fully developed. In my head, something just clicked, and thedragonfly came to symbolise my mental health too. I realised that every single timeI have an episode, as hard as it may be, as deep as it may go, I always immergestronger. It is as though, I need to go through the episode to become the personI should be. Learning something more about myself each time. I have written a more in-depth post on my personal blog. If you would like to read it, please do pop over to Little Orange Dog, but hopefullynow our logo makes just a little bit more sense.